for the Super Bowl XLVI Halftime Show. 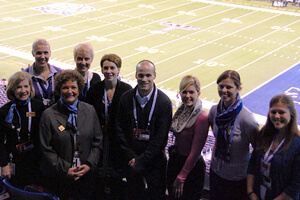 From Madonna's halftime spectacular to an ongoing party that brought more than 1.1 million people into downtown Indianapolis last weekend, several members of Drum Corps International's Indianapolis-based professional staff had the opportunity to work behind the scenes at Super Bowl XLVI. Volunteering their own time and expertise to the cause, DCI Director of Events Susan Kuehnhold, Manager of Event Operations Whitney Medworth, and Group Experience Specialist Susie Ferreira, got to see first-hand how the NFL and the City of Indianapolis pulled off what is being touted by many as one of the best run and most visitor-friendly Super Bowls in history. One of the colossal highlights of Super Bowl XLVI even before the New York Giants' defense secured a victory over the Patriots on the very last play of the game, was the Madonna halftime show backed up by a surplus of pop stars including LMFAO, Nicki Minaj and Cee Lo Green. Marching in during the 13-minute production to transition from Madonna's brand new single "Give Me All Your Luvin'" to her 26-year-old classic "Open Your Heart," was a 100-person drum line. Madonna's drum line gets ready to take the field. With talent tapped from local Indianapolis-area high schools including Center Grove, Avon, Fishers and Franklin Central, Ferreira and Medworth—thanks to a connection with a member of the halftime production company—worked as part of the casting team that organized the drummers. "I originally helped connect the production company with the high schools to recruit the members," Ferreira said. "Then as the group began rehearsing and learning the music, blocking and choreography for the show, Whitney and I got to help check everyone in and handle other logistics for the groups including the drum line as well as the choir and gladiator men who were also part of the show." In all, the drum line had about eight complete run-throughs to get the performance down with Madonna and the other celebrities. 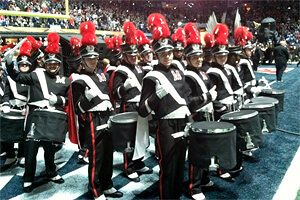 "Thursday before the game during our first dress rehearsal, Madonna did an inspection of each of the drum line members. She came up to them in their opening set to make sure they all looked good in their uniforms," Ferreira said. "She was so nice to everybody." 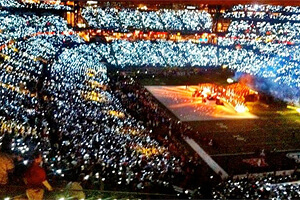 Susie Ferreira during the Super Bowl Halftime performance. On game day Ferreira had the chance to be on the field during halftime, helping manage the drummers as they marched from underneath the Lucas Oil stands to the multi-platform stage for about 30 seconds in the limelight before heading out again. "What an experience this was for the group," she said. "There was a really great moment during one of our rehearsals when the drummers learned for the first time that they'd also be performing around LMFAO and Nicki Minaj. They came on and they were freaking out!" Other drum corps connections to the on-field entertainment at the Super Bowl included a group that was utilized as part of singer Kelly Clarkson's National Anthem performance. The six percussionists included: Jason Hammond (percussion staff at Center Grove High School, Glassmen alum, bass drum staff at Troopers), Jeff Huffman (percussion director at Franklin Central High School, Star of Indiana alum), Jeff Queen (percussion director at Avon High School, many DCI credits), Josh Torres (percussion director at Center Grove, current Troopers staff), Brian Blume (percussion staff at Center Grove, and Northview High School), and Nick Taylor (percussion staff at Center Grove, snare drum staff at Santa Clara Vanguard). hosting duties during the Super Bowl festivities. 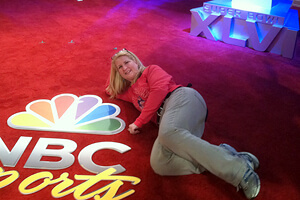 On the service end of the Super Bowl, Kuehnhold had the opportunity to put her event management expertise to work as part of a corps of 8,000 local volunteers recruited to bring Indianapolis' special brand of "Hoosier Hospitality" to visitors. 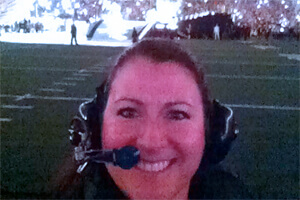 As a volunteer team captain, she was involved in a number of different areas of the Super Bowl festivities from crowd control at the Indiana Convention Center which hosted the NFL Experience fan convention, to acting as a host at a VIP party attended by celebrities like Adam Sandler and Danny DeVito, and checking security credentials at Lucas Oil Stadium beginning at 5 a.m. on Super Bowl Sunday. Kuehnhold says she was particularly impressed with the Super Bowl host committee's use of technology to initially train the volunteers, and then to keep them informed while on the job. "Just before the holidays, we all had to take 'Super Service' training online which is a citywide initiative all service workers took to be consistent with what we were saying while on the job and how we were presenting information and representing the city," Kuehnhold said. team of Super Bowl suite assistants. Volunteers also received daily text messages informing them of everything from weather conditions to alerts on crowded areas in the Super Bowl Village so they could be on high alert and armed with the most up-to-date event information to share with the public. After completing duties with the halftime casting team, Medworth also had the opportunity to volunteer at Lucas Oil Stadium on game day. "As an assistant with 26 suites to manage, I was there to make sure everything was running smoothly and that everyone had everything they needed," she said. With people entering the stadium as many as four hours before the opening kickoff, Medworth says she got to interact with a number of well-knowns including NBA personality Shaquille O'Neal, singer Katy Perry and director Spike Lee. As the Drum Corps International World Championships get set to return to Indianapolis and Lucas Oil Stadium for the fourth straight year Aug. 9-11, 2012, the DCI team members who spent their time working on the Super Bowl are excited to utilize what they learned from the experience as they continue planning DCI's biggest events of the season. "It was cool to see that while the Super Bowl is on a much bigger budget than we are, the way they run things is quite similar to how we do it," Medworth said. "Seeing the way they structured things and how they dealt with last minute changes on this large scale was all very educational for me." "I came away from this experience with lots and lots of ideas to improve our own Championship events," Kuehnhold said. "Sure there are a lot of ideas which we can't afford on our nonprofit budget, but nonetheless, being able to observe how the Super Bowl host committee and the NFL structured their own event processes and how deeply they planned for everything from bad weather to natural disasters, was fantastic. "I'm really kind of geeked to have seen how the city pulled together for all of these Super Bowl festivities and how we can channel that energy and success into our own drum corps events."